Material: Made of Polypropylene plastic.These Toy Soldier Sets are environmentally friendly, non-toxic, really safe for children to play with. Size: Army Men Figures Stand up to 2-3 inches tall. Absolutely amazing Toy Soldier product. Easy storage: This army toy set comes with a plastic zipper closure bag for easy storage after use. Plastic bag also comes with a handle for easy transport. Perfect Gift: Great for dioramas, pretend play, historic reenactments, or other educational purposes.Especially suitable for playing with other children. It can foster children\'s ability to collaborate and communicate with others.Great gift for Chrismas,Halloween or other occations. 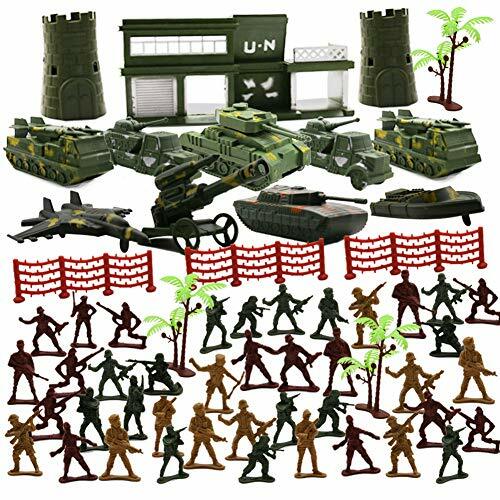 Each package includes: 146 pieces of miniature army figures and accessories. There are 100 total soldiers in different colors and in various positions. Package also includes an assortment of military equipment (Tanks, Fighter Planes, Flags, and More) and a variety of battlefield accessories for setting up the scene.